Drizzle 2 tablespoons olive oil onto the prepared baking sheet; place zucchini slices in the oil. Drizzle 3 more tablespoons olive oil over zucchini slices; season with salt and black pepper. Toss coated zucchini slices with 1 cup bread crumbs. Bake in the preheated oven for 15 minutes. 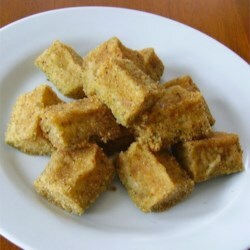 Toss zucchini slices with remaining 1 cup bread crumbs. Return to oven and bake until zucchini is soft and bread crumbs are lightly browned, 15 to 20 minutes.